Leading Manufacturer of mxl2 precision pipe & cable locator, gold detector, cable fault locator, pipe and cable locator, professional metal detector and underground cable tracker from Ahmedabad. 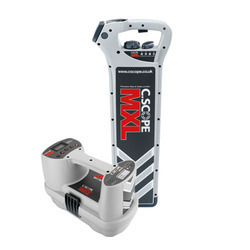 The MXL2 is a high performance precision pipe & cable locator developed using the latest in advanced digital signal processing technology packed with the most advanced features . It is the ideal equipment for utilization in job sites demanding quick & clear position of buried pipe and cables prior to excavation in even the most difficult of environments & very specific route tracing of buried services. Designed to detect, identify and route trace specific buried pipes and cables reliably and accurately, even in the most congested areas .The MXT2 transmitter provides longer distance tracing than previously possible. Combined Visual Response & Clear Audible Response. Battery Condition Indicator, Signal Strength, Mode Selected. Bluetooth Connectivity (Only on DXL DLB). 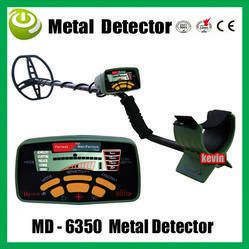 This MD-6250 underground metal detector, the upgraded MD-6150, is a kind of professional detecting equipment. It is easy to carry and operate. It can scan the metal objects easily and quickly, which can help professionals a lot when they do the research. And it is won't make mistake and fake alert. The MD-6250 is designed with exclusive Graphic Target ID technology to distinct the metal objects. It can select the type of metals in gold, silver, iron and so on. You also have color green and yellow to choose. Detecting metal objects buried underground. Widely used in security check, professional treasure hunting, material check etc..
1. POWER Pushbutton (press and hold to reset to factory recommended settings)—Press and release to switch the unit ON and resume hunting with the same settings and modifications used prior to turning the unit OFF. When the POWER pushbutton is pressed and held for 5 to 10 seconds (until the detector beeps), the MD-6250 will return to the factory recommended settings of each MODE. 2. Upper Scale—The Upper Scale, where the Target ID cursor is illuminated when hunting, consists of twelve (12) graphical segments for more precise Target ID and discrimination. 3. Coin Depth—Coin Depth is expanded to four (4) depth indicators including “2”, “4”, “6” and 8+ inches. 4. Sensitivity—The MD-6250 has eight (8) Sensitivity settings for more precise depth and target detection. 5. Battery Condition Indicator—An LCD display is continuously illuminated to indicate the battery level. 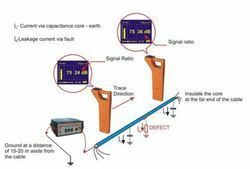 We are one of the leading suppliers and distributors of a wide range of Cable Fault Locator to our clients at affordable prices. These are procured from the trusted vendors in the market. These are used for testing the broken cables in telecommunication sectors. Our range is highly demanded for their durability and efficiency. We check the quality of our instruments on various attributes to offer flawless locators to our clients. 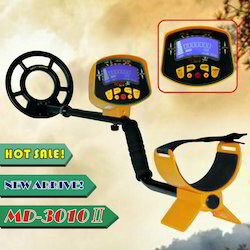 • Fully Automatic And All Metal Detectors: The MD-3010II detector detects all kinds of metal objects. Unless you have set for some objects that you do not want to detect. • LCD: The LCD comes with light, it improve to identify the metal in night or caliginous outside. • Target Identity: The detected objects are shown on the LCD display. You can decide immediately if the objects worth to be recovered. • Unwanted Target Elimination: You can set the detector not to respond to some objects. • Unique Tone For Target: You do not have to keep watching the LCD display, when an object is being detected, an unique tone corresponding to a target will generate. You may even searching when there is little or no light. • No Clumsy Slack Cable: Hidden search coil cable (connecting between control unit and search coil) avoid entangling and for ease of stem length adjustment. • Headphone Jack: Provided for headphone connection. Both stereo or mono headphone can be used. • Volume Control: For adjusting the output volume to the loud speaker or headphone. • Batteries Condition Indicator: Shows the conditions of the batteries in the battery compartment. • Waterproof Search Coil: Lets you use the detector in the shallow water. • Adjustable Stem: Lets you adjust the detector’s length for comfortable use. The micro-plug that connects the search coil and the controller unit is made of metal which makes the plug more reliable. • Armrest & Stem: Designed to eliminate strain on forearm. The nylon bracket to further secure the slip of the hand compartment after long time holding the detector by arm. • Power: Use six 1.5 volt AA alkaline batteries.